A Celtic Cross is a symbol that combines a cross and a circle. The circle is around the intersection of the cross. And I would rate this origami celtic cross, designed by Darren Abbey, as being of a high intermediate level of difficulty. 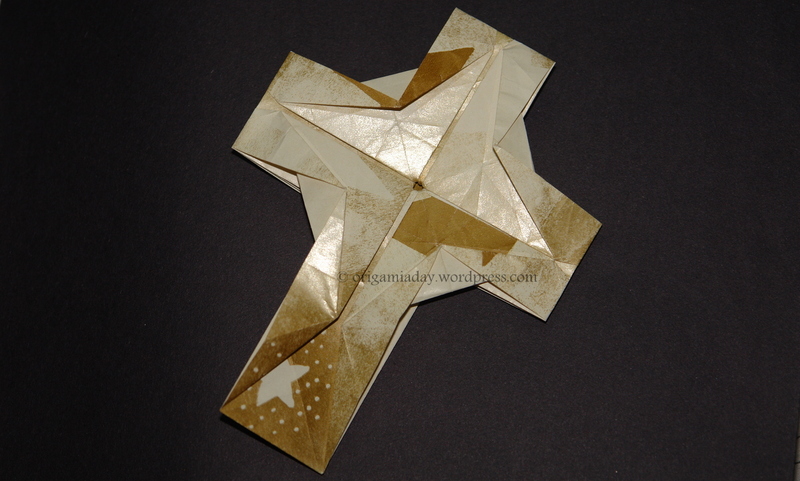 It took me quite some time to fold the cross for the first time. But then, the more effort you put in, the more pleasure you gain from the end result 🙂 It still hasn’t come out as well as it should, but I’m getting there..
1 reason I found the folding difficult is because, from the diagram, I couldn’t clearly make out the mountain and valley folds. Anyway, I finally sorted it out and ended up with a nice celtic cross! If you are trying out the cross for the first time, I suggest that you try with a square of at least 9 inches. PS: If you are using a Firefox browser and are not able to connect to the site Dynamic Miscellany, try using Internet Explorer. I had some difficulty connecting with Firefox.. Here is a quick tutorial to make a cross from palm leaves, great for Palm Sunday, which is this Sunday (17-April). And if you want to try out some simple crosses, here is one made from a strip of paper and here is another, from a square. Both should be done in a jiffy..